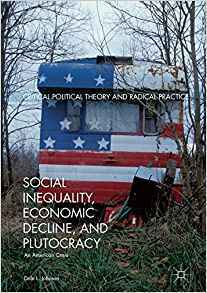 Social Inequality, Economic Decline, and Plutocracy: An American Crisis, Dale L. Johnson, Palgrave Macmillan, 2017, 240 pp. $159. Published on New Politics volume 16, number 4, 2017. Social Inequality is not for the faint-hearted. It covers the major political-economic issues of our time, from the structural changes in the economics of capitalism, to class structure, the imperialist state, and the distortions of capitalist culture. The author, a veteran scholar-activist of the New Left generation who now lives in Costa RicaDisclosure: Dale Johnson and I were colleagues and political allies at Livingston College, Rutgers University in New Brunswick, N.J., from about 1970 until our retirements., ends with a plea for resistance to our oligarchic “hegemon” and suggests a series of tactics to help us on the road. In the United States, making so many people barely able to get by is a strategy deliberately promoted by “plutocrats and their servants in political power—President Trump, Republicans in Congress, and corporate Democrats.” (3) This plutocracy, Johnson tells us, is itself dominated by “the … 0.001%, the oligarchs of the financial center.” (17) He views the financial fraction of U.S. capital (banking, investment funds, insurance, real estate, and so on—or in short, Wall Street) plus the financiers and finance ministers of major countries and the heads of European and international banking institutions, as the determining factor “in a hegemonic project to remake … world society into a savage capitalism in which their vested interests and class privilege are sacrosanct.” (16) This grouping enacts its policies through interlocks with corporations in all sectors of the economy and uses the power of money to influence state policy everywhere in the world. The degree to which finance capital has come to supersede “productive” capital and today dominates the economy has been debated for many years. G. William Domhoff has produced a series of works demonstrating the interconnections between the corporate sector, the state, and cultural institutionsSee, for example, Domhoff, “Interlocking Directorates in the Corporate Community,” and Domhoff, Clifford Staples, and Adam Schneider, “Interlocks and Interactions Among the Power Elite: The Corporate Community, Think Tanks, Policy-Discussion Groups, and Government,” www.whorulesamerica.net.. Domhoff demonstrates that leaders of most large corporations, both financial and industrial, typically hold board seats in a number of other corporations of both kinds. Identifying the financial sector as dominant when it is so interlocked with other corporate elements is misleading. It is an exaggeration to say that “the mode of economic recovery … since the latest crash has nothing to do with the opening of new avenues of economic development and everything to do with resurgence of speculative activity” by the financial sector. (23) In fact, industrial development continues to play an important role within U.S. capitalism, and perhaps an even more important role in the “emerging” economies, including in the former Soviet satellite countries. Johnson’s thesis that this fraction so overwhelms that “there is apparently no current serious division within the dominant class as a whole” is also open to question. He admits, in a later section, that the divisions within the Republican Party leading to the present chaos of the Trump regime do reflect some disarray within our ruling circles. It follows that the corporate plutocracy has never been monolithic. It is split into fractions with diverse interests. There are policy differences between a traditional internationalist wing (symbolized by the Clinton candidacy and much of Wall Street, and channeled through such institutions as the Council on Foreign Relations) and a more maverick wing (the Koch brothers; the Heritage, Cato, Pioneer, and American Enterprise foundations; and of course Trump himself). This is the tendency once labeled “cowboy” or “sunbelt” capital. Johnson is, however, on firm ground when describing the historical background to the current “unrestrained rule of capital.” (25) His many years of expertise has been in exploring the development of capitalism in the colonial and later neocolonial world. He shows how the slave system produced surpluses that enabled merchant capital to become the dominant fraction of the capitalist class, and how very soon those surpluses provided the foundation for industrial development. This form of globalization, in which the colonial world exported raw materials and imported manufactured goods, led to what he and like-minded scholars called dependent development. So-called third-world countries were not, in fact, “underdeveloped.” They developed as exploited dependencies in such a way that they remained poor. Over many years this has changed as globalization trends led to the gradual industrialization of the “third world” and the incorporation of former peasant and plantation labor into modern factory labor as these economies became integrated into global capitalism. This development is not necessarily accompanied by democratic forms of government. In fact, Johnson insists, real democracy is in scarce supply not only in the “emerging market” economies, but throughout the capitalist world. In the United States today, as Johnson sees it, we have a stagnant economy in which capital prioritizes unproductive and destructive activity: speculation, the pillage of the natural environment, increased militarization, and intensified exploitation of labor at all levels. This constitutes nothing less than a new phase, which Johnson calls “degenerative development.” This phase is accompanied by changes in the class composition of capitalism. The blue collar industrial working class is in decline, but basic working-class occupations also include clerical and sales workers, teachers, workers in the food and recreational sectors, and the unemployed. “Contingent” (part-time, seasonal, occasional) workers overlap all of these. Johnson reluctantly uses the term “underclass” in designating workers in the informal (off the books) economy, plus welfare recipients and the homeless, as objectively working class. Together these various parts of the working class add up to nearly 70 percent of the employable population. The working class, Johnson makes clear, has not disappeared into the great “middle class,” which is a deliberately mystifying statistical abstraction. If we define “middle” as, say, those earning from two-thirds of median income to twice the median (about $54,000 to $162,000), most of them are objectively working class. The traditional old middle class (the “petty bourgeoisie”) is only one fraction in what Johnson calls the “intermediate class.” (52-55) Another fraction includes administrators and supervisors. However, his putting semi-autonomous and service professionals (including state employees) into the middle class is questionable. This is the grouping that a number of left sociologists have included as part of the “new working class.”See, for example, Richard Hyman and Robert Price (eds. ), The New Working Class? White-Collar Workers and Their Organizations (Macmillan, 1983); Martin Oppenheimer, White Collar Politics (Monthly Review, 1985); Richard Sobel, The White Collar Working Class (Praeger, 1989). The different fractions of this intermediate class have different interests. Small business owners are frequently anti-union and oppose increasing the minimum wage and similar reforms. Supervisors’ jobs are primarily to support corporate and state hierarchies. “Professionals” are becoming more like other workers as they lose decision-making autonomy. The intermediate class is bifurcated, the majority being pushed into the working class and even unemployment, while a minority becomes the “line and staff servants of capital.” (208)This point has a long history. See C. Wright Mills, White Collar (Oxford, 1956). As more workers become employed in the lower echelons of the white-collar sector, Johnson wonders how working in unproductive and socially destructive enterprises affects workers’ consciousness. He thinks those who are becoming deprofessionalized (teachers, social service workers, medical workers) are likely to be open to change, but he has his doubts about those who work in the more directly repressive occupations, like the police. He is wrong, however, in saying that the petty bourgeoisie is being eliminated, as Marx predicted. Although the bankruptcy rate for small business start-ups is considerable, Bureau of Labor Statistics data show that the sector overall is doing well after a dip following the Great Recession. A major contributing factor is the outsourcing and subcontracting of work by larger corporations and the public sector in order to lower labor costs. Meanwhile “the social gains of centuries of struggles of colonized people for independence and by oppressed peoples for liberty, equality, and fraternity” are being undermined by plutocracy’s agenda—increased exploitation of people and natural resources in the service of profit. (86-87) As protests increase, the state becomes more repressive and is gradually reduced “to its essence, the security apparatus.” (82) Social divisions based on race, ethnicity, gender, and other differences within the working class are manipulated throughout the culture to prevent unification and political mobilization. The racist nature of the criminal “justice” system undergirds these social divisions through its exercise of a punishing level of military force in African American neighborhoods.It is not true, however, that a majority of people killed by police are Black. While it is true that young Black men are killed at about seven times the rate of whites, the absolute figures show that more whites than Blacks are killed by police in any given year. Johnson devotes Chapter 8 to a fine-grained description of how our current “super rogue” warfare state developed and today carries out its strategy of “official terrorism,” and what the impact of our “imperial ambition” has been on the peoples of the world, from Afghanistan to Iraq to Libya and beyond. He believes that considering the totality of this development, the United States is moving toward a new form of fascism. However, I question his lumping together under that label a variety of authoritarian regimes (from Nazi Germany and Fascist Italy to Franco’s Spain, Imperial Japan, and even South American military dictatorships) that differ in the class composition of their oligarchies, their mass bases (if any), the economic juncture that gave rise to them, and their outcomes. In the following chapter Johnson, again in microscopic detail, describes the ruling ideology of capital and its program: neoliberalism, closely associated with globalization, financial deregulation, and “the commodification of useful services to bring all cultural, social, and economic activity into the sphere of capital,” otherwise known as privatization. (145) He takes Greece as a sad case study of the results of these policies. In the United States, these consequences take the familiar form of the loss of manufacturing jobs due to NAFTA and other trade deals. This program has of course generated opposition: Podemos in Spain, the apparently failed Syriza in Greece, the isolated and splintered left in France and Germany, and the right-populist parties throughout Europe. Johnson describes how elected governments of the left, as in Ecuador and Bolivia, have been trying to extricate themselves from the period of dependent development and poverty for the masses, with mixed results due to a continuing dependence on primary-goods exports to generate capital. Also, every effort to improve the living standards of the working class and the indigenous population, including in Cuba and Venezuela, has met with intense opposition from local bourgeois elements, often backed by the United States. The hostility to reforms on the part of the U.S. oligarchy and its state, extending to coups and attempted coups, is well known. Johnson has long been an enthusiastic supporter of the Cuban Revolution and of Chavez’ “Venezuelan socialism.” He claims that Cuba continues to “develop its substantive democracy of mass participation.” (174) Meanwhile Venezuelan “socialism” appears to have degenerated into chaos. Johnson attributes all shortcomings to the problem of dependence on exports (sugar, oil) and to hostility and economic sanctions by the United States. There is no doubt that both problems have been severe impediments to progress. But are these sufficient explanations? That question is outside the scope of this review.However, for a left criticism see Gabriel Hetland, “Why Is Venezuela Spiraling out of Control,” NACLA.org/news/2017/05/03; “Why Is Venezuela in Crisis?” The Nation (Aug. 17, 2016); Jeffrey Webber, “Venezuela: What’s Going On?” Against the Current (No. 185, Nov.-Dec. 2016); and Samuel Farber, “Building Socialism in Cuba,” Jacobin, Oct. 12, 2016. In a lengthy appendix Johnson provides the reader with somewhat scattered lists of movement websites, blogs, relevant publishers, research groups, and other resistance sites. This is followed by an index that is so short as to be practically useless. Dale Johnson has provided us with what amounts to a textbook on contemporary international capitalism and how to fight it. The book represents a lifetime of engaged scholarship, and given its macro-level approach, makes a unique contribution to our understanding of world events. Its title, Social Inequality, Economic Decline, and Plutocracy, is somewhat off-putting (the subtitle, An American Crisis, is more to the point), and the book carries an unfortunate price tag that puts it out of reach of any but a decreasing number of wealthy university libraries. I hope a paperback edition is forthcoming. 1. ↑ Disclosure: Dale Johnson and I were colleagues and political allies at Livingston College, Rutgers University in New Brunswick, N.J., from about 1970 until our retirements. 2. ↑ See, for example, Domhoff, “Interlocking Directorates in the Corporate Community,” and Domhoff, Clifford Staples, and Adam Schneider, “Interlocks and Interactions Among the Power Elite: The Corporate Community, Think Tanks, Policy-Discussion Groups, and Government,” www.whorulesamerica.net. 3. ↑ See, for example, Richard Hyman and Robert Price (eds. ), The New Working Class? White-Collar Workers and Their Organizations (Macmillan, 1983); Martin Oppenheimer, White Collar Politics (Monthly Review, 1985); Richard Sobel, The White Collar Working Class (Praeger, 1989). 4. ↑ This point has a long history. See C. Wright Mills, White Collar (Oxford, 1956). 5. ↑ It is not true, however, that a majority of people killed by police are Black. While it is true that young Black men are killed at about seven times the rate of whites, the absolute figures show that more whites than Blacks are killed by police in any given year. 6. ↑ However, for a left criticism see Gabriel Hetland, “Why Is Venezuela Spiraling out of Control,” NACLA.org/news/2017/05/03; “Why Is Venezuela in Crisis?” The Nation (Aug. 17, 2016); Jeffrey Webber, “Venezuela: What’s Going On?” Against the Current (No. 185, Nov.-Dec. 2016); and Samuel Farber, “Building Socialism in Cuba,” Jacobin, Oct. 12, 2016.